Drawing on the wisdom and healing aspects of crystals, stones are intuitively read after being cast onto various mandalas. Crystal Mandala Readings are incredibly accurate and can empower you to move forward with clarity and ease. Gain insight on a particular situation, for example : career; relationship; any particular area where you feel stuck or lost; an event causing your stress or worry – or simply ask for a general reading to look at the energies currently influencing you. 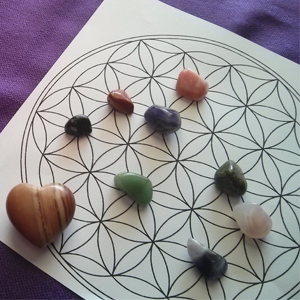 A ‘mini’ Crystal Mandala Reading draws from the interpretation of fewer crystals (single question/area of focus) whereas a ‘full’ reading provides much more in-depth guidance (up to three questions/areas of focus). Please note that I do not conduct readings with the intent of predicting your future or ‘fortune telling’. Readings are carried out in this present moment in love and light with the intention of providing insight and guidance for only your highest good. You alone are responsible for your own path.